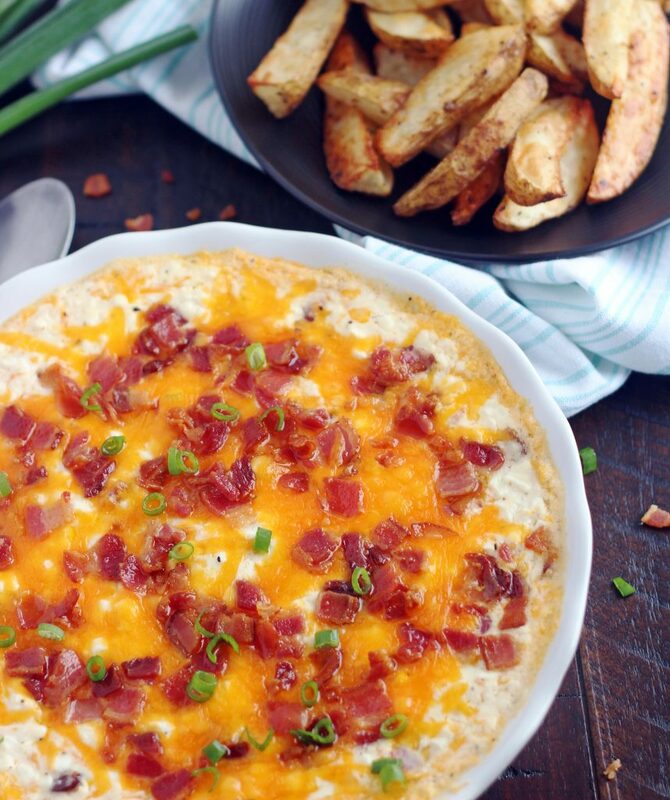 This Loaded Baked Potato Dip is quick, simple and crazy delicious. It’s loaded with everything you love about baked potatoes. It’s the perfect appetizer for any occasion. The Super Bowl is just days away and my sister-in-law and I have our menu planned for over a week now. Let’s be honest, it’s all about the food and commercials when it comes to the Super Bowl, right?! I’m really hoping the commercials will be better this year because the last few years have been a huge disappointment. I’ve got the most delicious appetizer for you to make for your Super Bowl party. . . 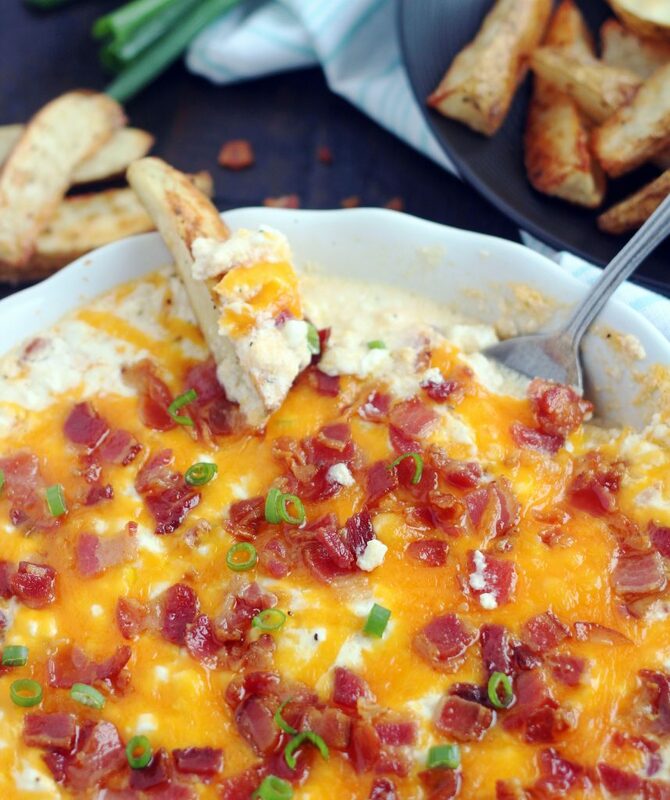 Hot Loaded Baked Potato Dip. You guys, it’s amazing. The first time I made this we devoured it, all of us. Even the picky ones in this household love this. 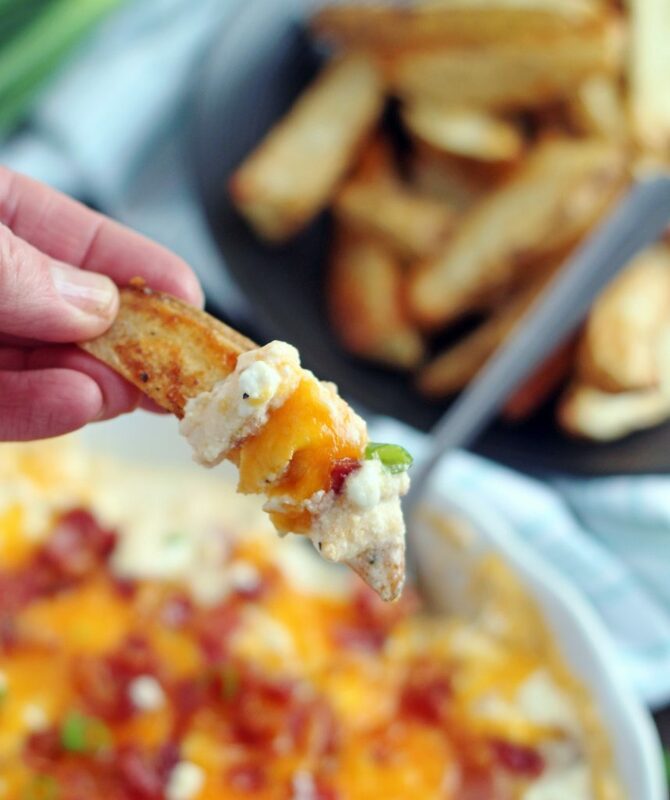 We ate it with waffle fries the first time and the next time I made my potato wedges and we were even more in love with this dip. I have even found myself eating this with just a spoon, no fries or chips even needed. In medium size bowl, combine the cottage cheese, sour cream, 1 1/2 cups of the grated cheese, 3/4 cup of the bacon, 1 tablespoon of the green onion, pepper, garlic powder and seasoning salt. Mix well and pour into a shallow baking dish. Top with remaining cheese and bacon. Bake for 15 or until cheese is melted and it just begins to bubble. Remove from oven and top with remaining green onion and let sit for 5 minutes. Serve with potato wedges, waffle or french fries and/or potato chips. You can certainly mix this up and eat it cold, which is also delicious, but we love it best after it's been warmed up. This definitely gets a little "runny" after baking it, so letting is sit for 5-10 minutes helps. Also try putting this over a baked potato, it's delicious! Oh it is!!!! You need to try it. Hi Caitlynn! Sorry about that, thanks for catching it and letting me know. I’ve fixed it. Take care.